According to Sister Faustina's visions, written in her diary, the chaplet's prayers for mercy are threefold: to obtain mercy, to trust in Christ's mercy, and to show mercy to others. "....When they say this Chaplet in the presence of the dying, I will stand between My Father and the dying not as the just judge but as the Merciful Saviour." Jesus also promised that anything can be obtained with this prayer if it is compatible with His will. Sister Faustina recounts in her diary that, in her vision, she saw an angel sent to a city to destroy it. Sister Faustina began to pray for God's mercy on the city and felt the strong presence of the Trinity. After she prayed the internally-instructed prayers, the angel was powerless to harm the city. In subsequent revelations, Sister Faustina learned that the prayers she spoke were to be taught to all the people of the world. According to Roman Catholic tradition, the chaplet may be said at any time, but it is said especially on Divine Mercy Sunday and Fridays at 3:00 PM. The Chaplet is prayed daily at the National Shrine of The Divine Mercy in Stockbridge, MA. In the Philippines, Singapore and Hong Kong the "3 o'clock Prayer" is broadcast on radio broadcasting & television stations daily at 3:00 p.m. In 2000, Pope John Paul II ordained the Sunday after Easter Divine Mercy Sunday, where Roman Catholics remember the institution of the Sacrament of Penance. The hour Jesus died by crucifixion, 3:00 PM (15:00), is called the Hour of Mercy. In novena, the chaplet is usually said each of the nine days from Good Friday to Divine Mercy Sunday. Pope John Paul II was instrumental in the formal establishment of the Divine Mercy devotion and acknowledged the efforts of the Marian Fathers in its promotion in a Papal Blessing in 2001, the 70th anniversary of the revelation of the Divine Mercy Message and Devotion. Although the prayers said on the beads of the rosary chain share specific similarities in the Chaplet of Divine Mercy and the Chaplet of Holy Wounds, these are distinct chaplets and were introduced over 20 years apart, one in Poland, the other in France. 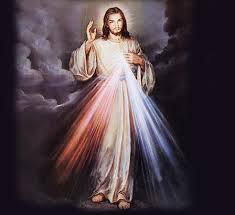 The Divine Mercy devotion is also observed by the Anglo-Catholics of the Church of England. Sister Faustina reported that Jesus told her, "Paint an image according to the pattern you see with the signature: Jesus, I trust in You… I promise that the soul that will venerate this image will not perish. I also promise victory over its enemies already here on earth, especially at the hour of death. I, myself will defend it as my own glory…I am offering people a vessel with which they are to keep coming for grace to the Fountain of Mercy. That vessel is this image with the Signature 'Jesus, I Trust in You." The chaplet is associated with two main icons painted in conformity with the visions St. Faustina received. The most widely used is a Polish image painted by Adolf Hyla. Hyla was compelled to paint the icon in thanksgiving for having survived World War II. In the image, Jesus stands with one hand outstretched in blessing, the other clutching the side wounded by the spear, from which proceed beams of falling light, red and white in color. An explanation of these colors was given to Sister Faustina by Jesus himself saying, "The two rays represent blood and water." This has been attributed to the "blood and water" referenced in the Gospel of John, (John 19:34) and which is also mentioned in the optional of the Chaplet. The words "Jesus I Trust in Thee" usually accompany the image, ("Jezu Ufam Tobie" in Polish). The original Divine Mercy image was painted by Eugene Kazimierowski in Vilnius, Lithuania under St. Faustina's direction. However, according to her diary, she cried upon seeing that the finished picture was not as beautiful as the vision she had received. After much distress, Jesus comforted Sister Faustina saying, "Not in the beauty of the color, nor of the brush is the greatness of this image, but in My grace." The picture was widely used during the early years of the devotion, and is still in circulation within the movement, though the Hyla image appears to be the more commonly used. "Thou didst expire, Lord Jesus, but the source of life gushed forth for souls, and the ocean of mercy opened up for the whole world. O Fount of Life, unfathomable Divine Mercy, envelop the whole world and empty Thyself out upon us." (3 times) "O Blood and Water, which gushed forth from the Heart of Jesus as a fountain of Mercy for us, I trust in Thee!" First Day - all mankind, especially all sinners. Second Day - the souls of priests and religious. Third Day - all devout and faithful souls. Fourth Day - those who do not believe in God and who do not yet know Christ. Sixth Day - the meek and humble souls and souls of little children. Seventh Day - souls who especially venerate and glorify Christ's mercy. Eighth Day - souls who are detained in Purgatory. The devotion was celebrated unofficially in many places for some years. On April 30, 2000 (Divine Mercy Sunday of that year), Pope John Paul II canonized St. Faustina and designated the Sunday after Easter as Divine Mercy Sunday in the General Roman Calendar, with effect from the following year. He also decreed a plenary indulgence associated with this devotion. 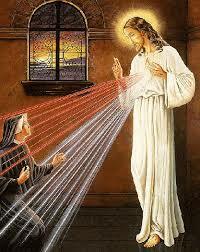 Pope John Paul II said he felt a closeness to St. Faustina when he was writing Dives in misericordia . He died during the vigil of the Divine Mercy Sunday 2005.